As the leader for the Cells and Synapses research theme, Professor Greg Stuart coordinates research focused on single nerve cells. He also has an important mentoring role, training the Centre’s researchers in techniques for recording from single cells and manipulating their activity using optogenetics. 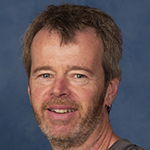 Professor Stuart is internationally recognised as an expert on information processing in nerve cells. He is based at Australian National University in Canberra, where he is Head of the Eccles Institute of Neuroscience.